Magic Bar Cookies are an easy bar cookie recipe that has been around more than half a century. Or if you’re looking for Valentine cookie ideas, use the same approach. Decorate these cookies in red, pink, and white variations. Layer chocolate chips, coconut, and chopped nuts evenly over the crust. Pour sweetened condensed milk evenly over bars. Use an angled spatula to spread milk into spots that are not covered. Sprinkle the bars with your favorite holiday colored cookie decorations. 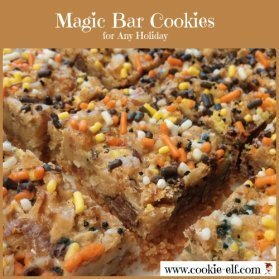 You can have a variety of bars in one batch by sprinkling half of the cookie surface with one type of cookie decoration and the other half with a different type. Set the cooled bars in the refrigerator or freezer for 30 minutes before cutting to get clean edges.